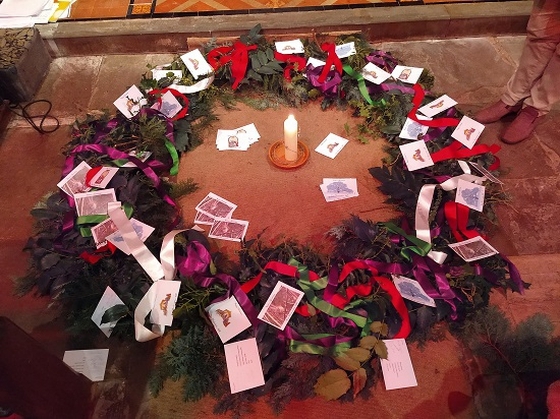 People gathered from across the Archenfield Group of churches to celebrate the start of the season of Advent with our Carol Service led by Revd Dr Mark Johnson, Rural Dean, and Revd Elizabeth Davies, Vicar of St Weonards benefice. We remembered four women highlighted by Amnesty International who are currently in prison, or under threat of arrest, for doing something we take for granted -- campaigning for human rights or for people with disability or for the environment. We prayed for them, and wrote words of encouragement to these individuals on postcards which we placed within the Advent ring around the single candle wrapped in barbed wire ... a small gesture of our solidarity with those who are suffering for speaking out. The combination of bell-ringers, the St Weonards benefice choir and recently-tuned organ made this a memorable occasion, all rounded off with a glass of mulled wine after the service. Thank you to everyone who came along, and particular thanks to Sir Richard Mynors for rehearsing the benefice choir and playing the impressive Toccata in 'Ave Maria Stella' by Flor Peeters as our closing voluntary.